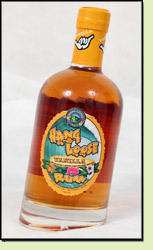 Andy: Hang loose has an offensively strong vanilla aroma and the taste matches it. It really almost tastes closer to a liqueur than a rum. It is very smooth but VERY thick. It tastes kind of like an overly sweet vanilla rum cake. This would be decent for baking or over some ice cream, but not something I would drink in most drinks. I found it for $8, and for that price, it is not a bad option for a vanilla rum. Adrian: This tastes like vanilla syrup. I might use it in baking but not in a drink. This is not good.